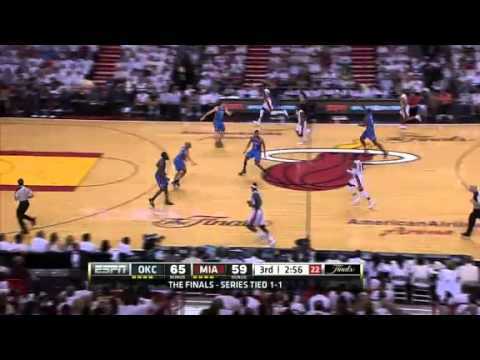 June 15, 2012 - Oklahoma City, OKA fierce clash of the titans resulted in Lebron James leading the Miami Heat over Kevin Durant and the Oklahoma City Thunder, 100-96 to tie the series at one game apiece in the NBA finals.Once again, the Heat jumped out to an early lead, starting the game with an 18-2 run. And again, the Thunder staged a furious comeback in the fourth quarter. But unlike Game 1, the rally fell short.Lebron led the Miami Heat with 32 points, eight rebounds and five assists, while Dwyane Wade added 24 points, six rebounds and five assists, Shane Battier with 17 points (five three-pointers) and Chris Bosh adding 16 points and 15 boards.Kevin Durant matched James's point total with 32 points, while Russell Westbrook scored 27 and James Harden added 21. 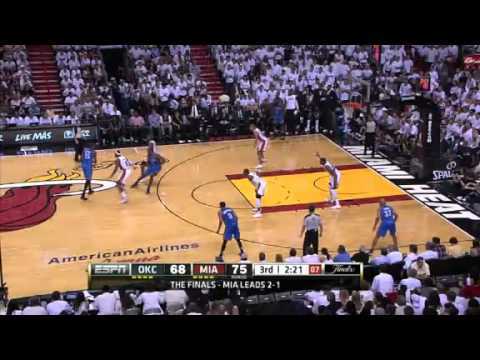 Durant scored 16 of his points in the fourth quarter despite being guarded by James, who is regarded as one of the top defensive players in the NBA.One of the keys to Miami's success was starting Chris Bosh, a lineup the Heat had never used during the postseason and regular season. 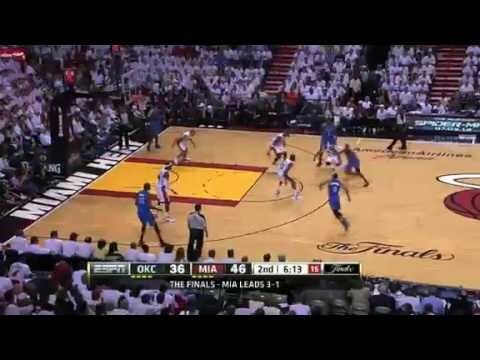 It resulted in a tremendous point advantage and the only quarter in which the Heat outscored the Thunder, knotting at 28 in the second quarter and scoring fewer points in the third and fourth quarters.You can warm up your golf game by checking out the super online reservation system at TeeOff.com. Just try here to see how easy it is to find quality links at low prices at the times you want. A fierce clash of the titans resulted in Lebron James leading the Miami Heat over Kevin Durant and the Oklahoma City Thunder, 100-96 to tie the series at one game apiece in the NBA finals. Once again, the Heat jumped out to an early lead, starting the game with an 18-2 run. And again, the Thunder staged a furious comeback in the fourth quarter. But unlike Game 1, the rally fell short. Lebron led the Miami Heat with 32 points, eight rebounds and five assists, while Dwyane Wade added 24 points, six rebounds and five assists, Shane Battier with 17 points (five three-pointers) and Chris Bosh adding 16 points and 15 boards. Kevin Durant matched James’s point total with 32 points, while Russell Westbrook scored 27 and James Harden added 21. Durant scored 16 of his points in the fourth quarter despite being guarded by James, who is regarded as one of the top defensive players in the NBA. One of the keys to Miami’s success was starting Chris Bosh, a lineup the Heat had never used during the postseason and regular season. It resulted in a tremendous point advantage and the only quarter in which the Heat outscored the Thunder, knotting at 28 in the second quarter and scoring fewer points in the third and fourth quarters. You can warm up your golf game by checking out the super online reservation system at TeeOff.com. Just try here to see how easy it is to find quality links at low prices at the times you want.